Why The Weekly Review is Essential. The one part of Getting Things Done that a lot of people struggle with is the weekly review. That’s the part when we take some time out of our crazy, busy, always on lives for some reflection, planning and thinking. Without this weekly time, no system is complete and, I would argue, no life is complete. The world we live in today is fast. Very fast. In the past we had time to think about and compose a letter, now we receive an email and minutes later we get a phone call or text message asking if we have received the email (I hate that!) When we wanted to book our annual holiday we had to go and get brochures, sit down and look through them and then visit a travel agent to book the holiday. It took days. Now a quick browse online and within minutes your flights and hotel are booked. The pace of life is the biggest change in terms of personal productivity in the last thirty years and it is not going to slow down. We don’t have time to stop and think about all the inputs that are coming our way and if you are not allocating just one of the 168 hours you get each week to a full and comprehensive review of all your commitments, tasks and collected stuff, things are going to slip, get missed and forgotten. This is why more than ever the weekly review is so important. It allows you to take a step back and gather your thoughts. It allows you to evaluate the direction you are going in and it gives you the opportunity to plan what you will do and when the following week. I like to think of my weekly review as my time off the grid. It’s when I put a stop on inputs for an hour and get everything zeroed out. My to-do list manager, notes app and email. I also go through my Twitter and Facebook messages as well as any other messaging services I use to make sure I have not missed anything — which is very easy to do given the number of inputs we have coming at us every day. Doing this allows me to start a new week with a clean sheet. It also means everything of value is in my system, processed and I know what and when something will happen with it. The reality is if you are not doing a weekly review you are just entering stuff into your system, adding random dates so you won’t forget something, but those dates are meaningless if you have not really given any thought to what needs to happen next. When the vaguely written task comes up, you take one look at it and push it off to another random date. When you do a weekly review you can give each project and task careful consideration and decide if you want to do anything with it next week. You can remind yourself of the outcome you want for that project and review it to make sure it is moving in the right direction. You can decide if you want to do anything with the project next week and if not you can remove the date. This means anything dated for next week has been thought through, a decision about exactly what needs to be done made and a date assigned that has meaning because it has been assigned with the knowledge of what will be happening on that day. How long should a weekly review take? As long as it takes. My weekly reviews take around 45 to 60 mins. I can do it faster, and I often do if my time is limited, but I never feel comfortable doing a quick review. I always feel I may be missing something and usually give myself a little extra time on a Monday evening to make sure everything is collected and a decision made on everything in my system. Over the last few weeks, I have been focused on writing about taking your personal productivity to a higher level. The weekly review is one of the cornerstones to achieving that next level of productivity. It’s where you find that calm controlled feeling. Knowing you have everything decided upon and knowing you will get whatever is required done on time and to a high level of quality. It also means that no matter how fast your world is, you will always have time set aside each week to review, reflect and adjust course if needed. You get the opportunity to catch up, to make sure nothing important has been missed and it means you begin a fresh week with a clear mind and ready for anything that will come your way. The key to a good weekly review is to customise it for you. Over on the Getting Things Done website, there is a great template you can use to follow in the early days, but you need to be customising it to fit your system and your way of doing things as quickly as possible. We all have slightly different system setups and we all have different projects and areas of focus. You decide which ones need reviewing and which ones do not need reviewing as frequently. If you really want to get in control of your work, projects and life, then develop a weekly review that works for you and make sure that doing the weekly review is a task set in stone each week. It is through doing a weekly review that everything will come together, it will ensure you are making the right decisions about what to work on and it will take you to the next level of productivity. Thank you for reading my stories! 😊 If you enjoyed this article, please hit the like button below 👍 It would mean a lot to me and it helps other people see the story. My purpose is to help 1 million people by 2020 to live the lives they desire. To help people find happiness and become better organised and more productive so they can do more of the important things in life. If you would like to learn more about the work I do, and how I can help you to become better organised and more productive, you can visit my website or you can say hello on Twitter, YouTube or Facebook and subscribe to my weekly newsletter right here. How to Find Your Productivity Enlightenment. What is productivity enlightenment? What do you have to do to become completely at ease with what you have to do so you feel calm, relaxed and ready for anything? That’s a question most people find themselves asking once they have a productivity system in place. Just having a system for collecting and organising your ideas, tasks and events is only the first step. It’s a very good first step, but there are a number of levels above this state you need to move towards in order to feel completely at ease with all the stuff you have to do. For a lot of people, these higher levels are elusive. They are elusive because although stuff is being collected and organised, the necessary decisions on what has been collected are not being made. If, after you have collected and organised your stuff, you still feel busy, overwhelmed and stressed it is likely you have a lot of stuff inside your system you have made no decisions about. These tasks and ideas are just in your system taking up space, but you do not know what you need to do next to take them to their natural conclusion. What is the outcome I want here? What do I need to do to reach that outcome? When will I do it? If you have not made those decisions, they will still be in your head. On top of that, each day you have bosses, customers, friends and family giving you new things to do, it is no surprise you feel stressed out and overwhelmed. Not only are you undecided about much of the stuff you have already collected, you now have to make decisions on what you will do about all these new inputs as well. Just getting it out of your head and into a system is the first step. The next step is to make decisions about the outcome, what do you need to do to reach that outcome and when will you do it? A decision could be to not make a decision. For example, you may have an idea of creating an online course. You sketch out some ideas about the tasks you will need to do in order to create the online course, but you decide right now is not the best time to do it. That’s fine. But you do need to decide when you will come back and revisit this project. It could be in three, six or twelve months, but you do need to make a decision and make sure that decision is in your system. Adding a task that says “review online course project” and dating it for three months in the future is all you need to do to take it off your mind. Once you have made these decisions though, you are only 75% of the way there. Why only 75%? That’s because where you put that task or thought matters too. Write it down on a loose piece of paper and have bits of paper all over the place means you are now worried about losing the paper. To clear the final 25% you need to trust where you put the task or idea will show up when you need to see it. It does not matter if you use a notebook or a digital to-do list manager or notes app. Whatever you use you need to trust it. Trust that it will show up on the day you need to see it or it will be in a place you know you will find it when you need it. This is why people like David Allen, Sir Richard Branson and Cheryl Sandberg have been using the same set of tools for years. It’s because they trust them. They work and they don’t waste time trying to find anything. From my own experience, for example, app switching destroys trust in your system. I’ve been through that process of continually looking for the ‘perfect’ set of apps and discovered each time I think I have found the ‘perfect’ app it doesn’t do exactly what I want a productivity app to do and I go off looking for another one that does. It’s an endless search involving multiple compromises and a serious lack of trust in my system. The only way to build trust in your system is to stick with one set of apps and learn everything you can about those apps. Subscribe to their blog so you know what updates have come and how those updates will impact your system. Go through every menu item and sub-menu. Look at the preferences and see what you can do. Do everything you can to learn about the apps you have chosen. With knowledge and time, you build trust and with the trust, you discover what true productivity enlightenment is. So if you want to experience true productivity enlightenment, clear stuff from your head as soon as it arrives, make a decision about what needs to happen next and when you will do it and get it into a set of tools you trust. That’s it. That’s the secret to a stress-free life and productivity enlightenment. Thank you for reading my stories! 😊 If you enjoyed this article, please hit the like button below👍 It would mean a lot to me and it helps other people see the story. Are You Ready For Anything? There are many different levels of being organised. There’s not being organised — where everything is a mess and you have absolutely no idea what’s going to happen next. Then there’s the situationally aware state where you know where everything is and are prepared for anything. Most people are somewhere between those two extremes — usually nearer the disorganised end. When you decide to get yourself organised and focused on the things important to you such as your relationships, your career and your goals, you begin to move towards the situationally award end of the spectrum. This is where no matter what is thrown at you you are able to deal with it in an appropriate way. You won’t panic, you won’t get stressed and you will always be in a position to allocate sufficient time to manage whatever it is. This means, on a day when you have back to back meetings all day — meetings that are important for a project that has a deadline coming up in three days — and your ailing mother is rushed to hospital, you are in a position to be able to cancel the meetings so you can spend the day with your mother without stress or concern. Part of being situationally aware is understanding what is truly important to you. If you take a step back, an ailing parent rushed to hospital should always be your priority. Meetings at work related to an important deadline in this situation are not important (no, they are not important at all, seriously!) Even a job interview for your dream job is not as important as being there for your mother. A quick phone call to the right person would solve the problem in less than 30 seconds. A job is a job and there are always plenty of jobs around. You only have one mother. When you understand what is important and what is not, making the right decisions in times of chaos and drama is easy. You make your decisions through a filter of strong values and priorities. You understand your priorities and you live your values. You can make split-second decisions based on those values and priorities. When you have all your projects and tasks organised in a solid system. Your important information is readily accessible — on all your devices — and you know what events are coming up, you are then in a situation where you are situationally aware. Recently, I interviewed David Allen for my podcast and during our conversation he mentioned he hated backlog. Where you have an overflowing inbox, email waiting for a reply and other stuff you haven’t dealt with or made any decisions on. When you have a backlog of stuff it’s very hard to be situationally aware. There’s just too much going on in your mind. Having a clear mind, knowing everything is collected and organised and you have a plan to do the work puts you in a state of complete calm. It means if something good or bad happens, you have the clarity and space to deal with it appropriately and return to your normal state. To me it’s the Bruce Lee analogy. “Be like water”. Water will always act appropriately no matter what you put it in. Put it in a teapot and it becomes the teapot, put it in a square container and it becomes the square container. When your mind is full of unprocessed stuff it is almost impossible to focus on the work that needs your focus. When you are trying to comfort a friend who is going through a hard time, you are unable to give them your total concentration because half your mind is still trying to deal with all the stuff you have still not made a decision about. You are unable to create a compelling story for your next presentation because you are still thinking about the engine warning light that came on in your car that morning and you have not externalised it or arranged for your car to go into the garage for a check. Having everything externalised and a decision made about what you need to do next is being like water. It’s about being fully engaged in what you are doing because your mind is clear of clutter and unprocessed decisions. The reality is unexpected events are going to happen. It’s just life. What we need to be is ready for them. We need to have the clarity of mind to know that whatever is thrown at us we can handle it because we have everything that needs our attention organised and under control. It means you are fully aware of your obligations to your family, friends and work and you know that no matter what happens you will always be able to make the right decisions. It means that when you need to design the new business cards you become a fully engaged designer, when you need to deal with a poorly performing employee you become a fully engaged counsellor and when you need to take care of your ailing parent you become a fully engaged caring daughter or son. Thank you for reading my stories! 😊 If you enjoyed this article, hit those clapping hands below many times👏 It would mean a lot to me and it helps other people see the story. Be Comfortable Not Doing What You’re Not Doing. Last week I received an email from a student in my Learning Centre saying he now felt guilty playing videos games — a hobby he loved to do. Despite becoming much better organised and more productive, every time he sat down to play video games he felt he was wasting valuable time. Becoming better organised and more productive is not about doing work all the time. Becoming better organised and more productive is about freeing up time so you can do the things you love doing. Whether that is playing video games, watching your favourite TV show or taking a walk in the countryside. One of the inevitabilities of life is our to-do lists will never completely zero out. There will always be something to do. Washing the dishes, cleaning the house, doing expenses, preparing our kids’ sports kit. While not all our tasks will be work-related, there will always be something we should be doing. If we accept our to-do lists will never be completely empty, and that it is impossible to be doing stuff 24/7, then we need to get relaxed about not doing work when there is work to be done. One of my favourite quotes from David Allen is “defining what you are not doing is as important as knowing what you are doing”and that is where you need to get comfortable. Knowing there is work to be done and being comfortable not doing it right now. The key to creating a stress-free life and being productive is to be fully aware of what needs doing and making the conscious decision not to do that work at this moment. Instead, if you prefer to relax on the sofa and watch an episode of Mock The Week or Would I Lie To You ( two of my favourite TV shows) then do so. Of course, if you have a project deadline at 8 am tomorrow and you have not finished whatever work is required to complete the project, sitting down on the sofa playing video games or watching TV might not be the best way to spend your time. The project needs completing and that is where you would best be applying your time. And that is where the stress comes from. If you have a pile of stuff you are not sure what needs doing with, your brain is going to be constantly telling you to do something about it. It’s what in GTD speak is called “open loops” — unclear stuff to do with unclear deadlines and unclear next actions. The fear of missing something important becomes overwhelming and so if you do try to sit down for an hour or two to play video games or watch TV you will have this nagging voice in your head telling you you should be doing something else. The problem is you don’t know what. And so you have this vicious cycle going on inside your head and that is where your stress (and guilt) comes from. It’s a fear of the unknown and thinking you should be doing something else instead of what you are doing right now. When you have everything processed and put in its rightful place, you no longer have that worry. You know what you are not doing and are comfortable with the decisions you have made about what you are doing right now. You can play video games or play with your kids knowing everything is under control and you will have enough time to complete all your upcoming projects. That’s the wonderful thing about becoming better organised and more productive. No stress, no overwhelm and enough time to do the things you enjoy doing. If you feel stressed and overwhelmed by the amount of work you have to do, then I have a FREE course that will help you get control of your stuff. It will give you a framework to collect your ‘open loops’ and organise them in a system you create for yourself so you have control and you know what you have to do and you know when you can relax and do the things you love doing. You can get yourself enrolled right here. GTD — Getting Things Done by David Allen — is a great book with an equally great message. The principles and methods detailed in the book are sound, they work and have helped millions of people around the world to get organised and to become less stressed. But as with all things as good as GTD, the weakness in it is how people apply its principles. One good example is David Allen’s definition of a project which is, anything that involves two or more tasks is a project. Taken literally that means making an appointment for a haircut could become a project. You need to find your hairdresser’s telephone number and then call them to make the appointment. That’s two tasks. That’s a project. But really is it a project? Those two tasks could be done sequentially in less than five minutes. Do you really need to create a project for these tasks? The missing part of Getting Things Done is the part where common sense comes in. Were I to make a hair appointment, or a dental or doctors appointment, it would not become a project. Common sense tells me that to make an appointment to see my dentist can be done with a single task — make appointment to see dentist — even though there may be two or three tasks involved. Another example where taking what is written in a book too literally can be found in Robin Sharma’s brilliant latest book The 5 AM Club. The book’s premise is that you wake up at 5 AM, do twenty minutes hard, intense exercise (enough to make you sweat), then do 20 minutes planning — preferably in your journal — and finish off the hour with 20 minutes studying, or self-learning. I adopted the 5 AM Club principles early last year but modified them to better apply to my life and my circumstances. I wrote about my experiences and how I was getting a tremendously positive experience from it, yet I was informed by a well-meaning reader I could not be a “member” of Robin Sharma’s 5 AM Club because I do not follow the 20/20/20 principle. I do not do 20 minutes exercise followed by 20 minutes planning then 20 minutes learning. I disagree. Exercise first thing the morning causes me to feel dizzy and nauseous and I have found that planning my day is better done the night before. It removes anxiety and stress and leaves me waking up with excitement, energy and purpose. What my reader misses is that the 5 AM Club and GTD are not about the steps. They are about giving you a framework in order to achieve a desired end result. Whether I do my exercise at 5 AM or 2 PM as I do, doesn’t matter. What matters is I do the exercise every day. Whether I do my planning at 10:00 PM or at 5:20 AM doesn’t matter. What matters is I do the planning every day. I achieve the same results as if I did my exercise and planning at 5:00 AM. And that is the point. I wake up at 5 AM and do 45 minutes studying and 15 minutes meditation. It works for me. It leaves me feeling refreshed, energised and ready to make each day the best day of my life. Which is exactly what the 5 AM club is all about. And the same goes for Getting Things Done. Whether you turn your hairdresser’s appointment into a project or treat it as a single task doesn’t really matter. What matters is you get your hair cut. Getting the work done is far more important than the process you have in place to tell you what needs doing. We are all different, we all have different ways of doing things and we all think differently. What GTD and the 5 AM Club do is provide you with fantastic ideas and a framework to improve your life. How you implement those ideas into your life is up to you because those ideas need to work for you. Pure GTD did not work for me. Too many things slipped through the cracks and my projects list became overwhelming. It took far too much time to maintain my system and it wasn’t until I broke away from treating every multiple task as a project that GTD really started working for me. But at the core, my whole COD system is built on the foundations of GTD it’s just stripped down to work better for the way I think and work. Equally, the message in Robin Sharma’s book is about making a significant improvement in your life by waking up early and spending some time developing your mindset, heartset, healthset and soulset. I do that every day. It’s just I do things in a different order, an order that works better for me. And that’s really the point. David Allen’s GTD and Robin Sharma’s 5 AM Club have a fantastic message and they both give you ideas and strategies that can give you incredibly positive results. But you do need to take those principles and apply them to your life. If you start work at 5 AM in the morning, then perhaps you need to wake up at 3 AM and do your self-development work, or with GTD perhaps you want to redefine what a project is for you. It could be four or five steps before something becomes a project. The way you define it is less important. What is important is that you are capturing your stuff and then organising it in a way that is meaningful to you. That’s how you get to improve your life and that’s how to take the ideas you learn and apply them to your life to make positive change. How I Use My Apple Watch To Maximise My Productivity. One of the surprising things in my life is my Apple Watch has been the biggest influence on my personal productivity since I first got an Apple Watch in 2015. Surprising because what I first saw as a device to monitor my exercise very quickly became the centrepiece of my productivity collection process. The integration of Siri with the Apple Watch a couple of years ago was the catalyst for the productivity gain. If I need to collect an idea or a task or just add an item to my shopping list, all I have to do is raise my wrist and add the task or item to my list. It could not be any simpler. No typing, no opening of apps, just raise and speak. Whenever I am coaching people, I always stress the importance of making sure collecting your ideas, tasks and events has the least amount of resistance. Whether you are using a pen and piece of paper or your phone, you should be optimising your collecting process so it is fast and easy. When your collection process is fast and easy you are much more likely to collect everything and not ‘trust’ your brain to remember it. For me, the Apple Watch has made the collection process so much easier. It is true I now collect a lot of things I later decide has no importance to me, but if you want a productivity system to really work for you, collecting everything is what matters. Later, when you do your processing you can decide, in a cool, reflective way, whether it is relevant to you or not. Deleting a task or idea is simple and only takes a split second. Not collecting that task or idea could cost you a lot of time and money later. So, an increased volume in my inbox is not something I worry about. So, how do I use my Apple Watch to improve my overall productivity? On my watch face, I use a customised Infograph. At the top I have today’s weather by temperature — a useful piece of information in South Korea as the temperature can vary quite significantly — and my exercise app so when I begin my exercise the Workout app is easily accessed. In the centre of the face, I have the calendar complication at the top. This gives me today’s date by number as well as my next appointment. This feature is fantastic as it means with just a glance I know exactly what I should be doing next and when. I have my deep work sessions on my calendar with a clear description of what I want to work on during that session so with a glance at my watch I can see exactly what I will be working on next. Also, in the middle of the face, I have the times in LA and London. I work with clients in Europe and the US, so knowing what time it is in those times zones is a very useful piece of information to have at hand. I also have my activity tracker in the centre to let me know how I am doing on my activity metrics for the day — this helps me decide whether to get off the bus a few stops earlier to ensure I close all my activity rings for the day. Finally, at the bottom of the face, I have the timer and Drafts Apple Watch app. I use the timer for when I am meditating and cooking. I like to do a fifteen-minute session of meditation in the morning after I have finished my studying and the timer means I do not need to looking at my watch to see how long I have been doing. Instead, I get a vibration from the watch to tell me fifteens minutes are up. Drafts is the hub of my collection process. I use Drafts to collect everything I want to collect. Even on my phone, I prefer opening up Drafts, typing or dictating whatever it is I want to collect and sending it off to its rightful place. On my watch its one tap and dictate. It’s incredibly fast and it maintains a discreet number on the watch face to tell me what is in my Drafts inbox. That helps me to know if there is anything in there that needs processing. Optimising the way you collect your stuff is how you continue to grow and develop your productivity system. Often it is the small adjustments to how you collect or how you organise your stuff that can bring you big improvements to your system. If you have a complicated array of systems to collect your stuff, you will resist collecting. If you are not collecting into a trusted place, you will resist organising and if you don’t know where anything is you will not be working on the work that matters. Using the best tools you have available to collect and organise your life and work and making sure these tools are set up so they work best for you is one of the fastest ways you can improve your overall productivity system. If you have a few quiet days this month, take a look at your system and see where you can make some small improvements. Look at how you collect your tasks, events and ideas. Can you make that collection faster? How are you organising what you collected at the end of the day? Can you improve your Golden Ten time? After all, the goal with any productivity system is being able to spend more time doing so you can spend more time doing the things you love doing with the people you love doing them with. Thank you for reading my stories! 😊 If you enjoyed this article, hit the like button below👍 It would mean a lot to me and it helps other people see the story. Why You Should Build Your Productivity Around Your System, Not Your App. Getting Things Done by David Allen is one of the best books around for developing a productivity system. It provides a framework in which you can develop a tailor-made system. Unfortunately, as with all books that become a bible in an industry it gets interpreted in many competing ways. We have the capture everything and spend an inordinate amount of time classifying and adding contexts to what you captured. Then we have the capture anything related to a project and add the task to the appropriate project and then we have the purists who add a context to everything and use contextual lists as their daily to-do list. I’ve been a GTD aficionado for coming up to ten years now and I admit I have travelled through all interpretations. In the last few years though, I learnt when I spend time in my to-do list organising my projects and contexts, I am not doing work. I used to have the most wonderfully organised To-do list manager. Every task was meticulously labelled and each task was assigned to a project. It was an obsession with me. But around three years ago I realised spending two hours or so in my to-do list manager every day organising and reorganising wasn’t actually getting any work done. I felt I was doing work, but I was not. I got myself stuck in organising and planning mode and I never got a lot done each day. And that is the problem when you spend so much time in your to-do list manager, or any productivity app organising and reorganising, you fall into the trap of believing you are being productive when you are not being productive at all. You are just being organising. The difference between being organised and being productive. Being organised and being productive are two very different things. Knowing where everything is is being organised, getting the important work done as efficiently and effectively as possible is being productive. Now, being organised is a good thing. It can save you a lot of time because you are not wasting time looking for what you need to do your work. But just knowing where everything is does not make you productive. Having a to-do list manager that is meticulously organised with dates, labels, links and projects is good. But it does not necessarily mean any work is getting done. If no work is getting done then there is no productivity. What you really need is a system that works for you. What you need instead is a to-do list that contains your important tasks and shows them when you need them. A quick glance in the evening before you go to bed should show you what needs to be done the next day, and when the next day begins you get straight on doing the work that matters. A to-do list manager should filter out the unimportant tasks so what you see are the important tasks. When you create a to-do list that does that, you dramatically increase your productivity. No app will do that for you, only the system you build will do that. It does not matter whether you are using Todoist, Things 3, OmniFocus, Trello or Notion, the app is only as good as the system you have in place. If the system you create involves a lot of maintenance, you are not going to be productive. You need to create a system that collects everything quickly and easily, where organising what you collect can be done in twenty minutes or less at the end of the day and the rest of the time it stays in the background only showing up when you have done your one or two most important tasks for the day. What matters is you are doing work that takes you forward every day. To do that you need to be able to see what tasks will have the biggest impact on your important projects and goals. When you fill your to-do list manager with unimportant tasks they quickly drown out the tasks that would move you closer towards completing the project or achieving the goal and gives you a false sense of being productive when in reality you are just running round in circles. When you couple that with spending too much time maintaining your system, you are simply not getting enough done against the amount of time it takes to organise everything. The ratio you should be aiming for is 90% doing and 10% organising. That equates to 7 hours 40 minutes of doing work and 20 minutes organising in any given 8 hour working day. This is why apps that have a large feature set fail in the long-run. While the developers are doing their best, feature-creep is a real problem for people who want to be more productive. More features mean more things to adjust and play around with. That requires time, time that would be better spent on doing work. If you want to become more productive, so you can spend more time doing the things you enjoy doing, focus on your system and not the app. Streamline your system so it is focused on collecting and doing and make the organising as simple and as easy as possible. Aim for a 90% doing and 10% organising ratio and when you get there, you know your system is well on it’s way to working for you. If you have the right system in place, a system that works for you, it will not matter what app you use. Your system will just work and that should be what you are aiming to build. Build your productivity around your system, not your app. Thank you for reading my stories! 😊 If you enjoyed this article, hit that like button below👍 It would mean a lot to me and it helps other people see the story. Why You Should Stop Using Tools For Jobs They Were Not Designed To Do. Over the weekend I foolishly got myself into a discussion about why a certain app didn’t have the ability to print. Being a long time user of that particular app, I knew the reason was because the vision the app’s developers had was to give their users the freedom to go paperless. Being able to print out notes, would contradict their founding purpose. I often see people complaining that this app doesn’t do this or that app makes it difficult to do that function, and in all cases I find it is because the person complaining is trying to get the app to do something it was not designed to do. In the case of the discussion I had over the weekend, Microsoft Word or Apple Pages would have done the job far better as those tools were designed for the job he was trying to do. Over the years I’ve seen this happen time and again. People trying to get Evernote to be a to-do list manager and then complaining because it doesn’t do the job very well. Trying to get Google Docs to be a note-taking app and using their email inbox as a to-do list manager And then claiming being productive is hard. None of these tools were designed to do the jobs these people were trying to get them to do. of course it is hard. It means you have to hack the app and create workarounds and all that does is add complexity and an increased likelihood there will be a productivity system breakdown. The goal of building your own productivity system should always be a seamless, simple system that is fast to collect, easy to organise and shows you what you need to see when you need to see it. You don’t need to be hacking anything to achieve that. There are thousands of free apps that will do the job for you. Even if you do not want to dive into the ocean of productivity apps available, Microsoft, Google and Apple provide specific apps for specific jobs built into your device for free. A simple system, using the tools that were designed to do the specific job you want to do will keep things simple and easy. Apple Pages — one or two page documents that need to look good printed. Adobe InDesign — for professional production of workbooks and PDF help guides. Ulysses — for all other form of writing. As you can see, there could easily be some overlap between apps. Pages and InDesign for example can produce very professional looking documents, but Pages does not have the professional print shop options that InDesign has. Page bleed for example, which is essential for printed documents. On the other hand, InDesign takes quite a Lot of setting up, where as Pages can be set up on the fly. So for short, one or two page documents that do not need printing, I would use Pages. Evernote could be used for writing blog posts and books as you can write the text and add images. But, in order to get an Evernote note to look professional when printed would take a lot of steps and I would have to trade a lot of functionality for blog posts when exporting to my blog just to get Evernote to work. It is far easier, and better, to use Ulysses, which allows me to use Markdown which formats my documents as I write them and publishes directly to my blog from the app. Simplicity does not always mean less. Simplicity means using the best tool to get the job done. I could use a trowel to dig a garden wall’s foundations, but it would take a long time and a spade would do the job faster and better. Just because the trowel is the best tool to dig up weeds in my garden, does not make it the best tool to dig the foundations. There are better tools. Part of the process of becoming better organised and more productive is finding ways to do your work better and more effectively. Part of that process is finding the right tools to do the right jobs. Many of the tools you need are free, others, such as Ulysses and Todoist, cost as little as $30 per year and the time and effort these apps will save you makes that cost an investment worth making. If you want to become better organised and more productive stop trying to hack apps to do jobs they were not designed to do. You have a lot of choice today, but a simple system based on having a set of tools to do specific types work will give you the best results in less time and with less stress. And that will do more for your productivity than trying to hack apps to do types of work they were not designed to do. 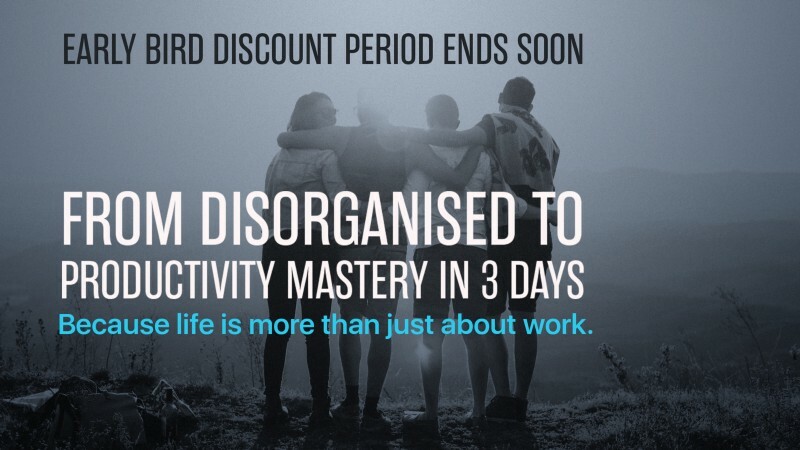 If you are ready to become better organised and more productive then take a look at my latest course, From Disorganised To Productivity Mastery in 3 Days! — A course designed to take you to productivity mastery in three days through a step by step approach over three days. Hurry, the early bird discount ends on tomorrow! (Thursday 18 October 2018). This course will change your life! You Will Fall Off The Productivity Wagon. Here’s What To Do When You Do. No matter how strong your intentions are, there will always be days, weeks or even months when you will lose your productivity habit. It happens to us all from time to time. I’ve gone through it so many times myself when I have become a disorganised mess and yet, I’ve always found a way to get back into my productivity stride by following a few simple strategies. Here are a few of those strategies you can use to get back into your productivity habits quickly when it happens to you. 1 Learn to recognise the trigger points. As they say, “prevention is better than cure” If you find yourself regularly falling off the productivity wagon ask yourself why. There are multiple reasons why a person may frequently fall off the wagon. It could be having an overly complex collection system to not having your collection tools with you at all times. Problems can also occur when you do not have clearly defined projects and areas of focus or you continue to ‘trust’ your brain to remember things. Find the triggers or the bottlenecks to your system and discover ways to remove them now before your habits fail. 2 Keep your system as simple as possible. One of the biggest causes of falling off the productivity wagon is over complexity. If you create a productivity system that is so complex, that when you find yourself inundated with work and imminent project deadlines, it’s easy to stop collecting and organising. The way to avoid this is to build as simple a system as possible. Focus on active projects, areas of focus and have a someday | maybe folder for all inactive or ‘would like to do’ projects. Creating a system involving complex project and task hierarchies may appear great at first but it will become a drag on your effectiveness eventually. Reduce the complexity. When you do find yourself in a productivity mess get back to the basic principles of COD — Collect, Organise, Do. These basic principles will always get you back on track. Collect everything that has your attention and is on your mind into one list. It does not matter whether it is a digital list or pen and paper list. All you need do is get everything into one list. Then organise the items you have collected into their right place — projects go into your project list, ideas into your notes app and appointments and deadlines onto your calendar. Starting from this position will always get you back into a state of organisation and it returns clarity and control into your life. 4 take some time out to gather everything together. Whenever I have fallen off the wagon, I set aside an afternoon or an evening to get things back under control. Usually, this would be a Friday or Sunday afternoon, but it really doesn’t matter when you do it. Once you recognise you have stopped being productive and you feel everything around you is a mess, that’s the time to take a step back and take some time off to get things back under control. Do a quick review of where your system is and what’s overdue and needs urgent attention, then go through the process of COD. I’ve always found this one step lifts a huge weight off my shoulders and fills me with optimism and energy to get things back on track. 5 Have a backup collection system on standby. There are going to be times when there is so much going on at work and in your personal life that it becomes difficult to keep up with everything going on. These situations are rare, but they do happen. If you find you are unable to maintain your system, stop worrying. A great trick is to switch to a piece of paper on your desk to capture everything, or a simple note open on your computer where you can just drop ideas, commitments and tasks when they come up. You can then “organise” these collected items later. There have been many times when I have been working at a client’s office and have not had easy access to my regular collection tools when I have resorted to using a single page in my notebook (I carry a notebook in my work bag everywhere I go). Once I get back to my own desk, I transfer the relevant items into Todoist or Evernote later. 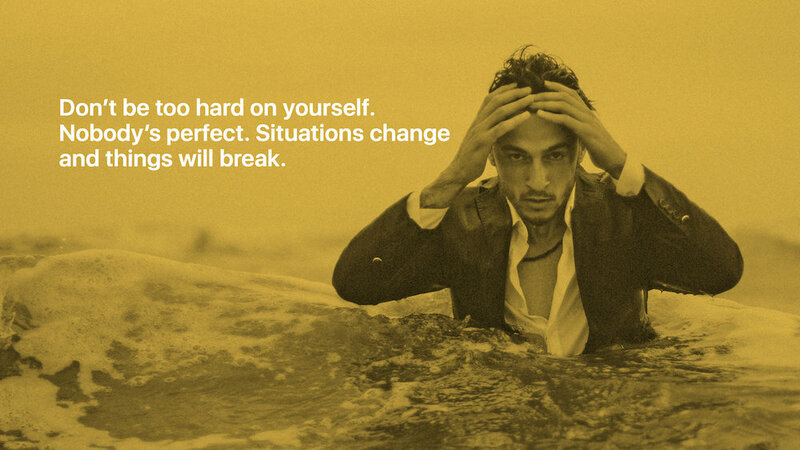 Don’t be too hard on yourself — nobody’s perfect. Situations change and things will break. The important thing is you have a system in place that makes it easy to jump back on the productivity track quickly and without too much effort when you do fall off. It happens to us all at times but the key is to have a way to quickly get back on the productivity wagon when you do fall off. Be Focused On Your Outcomes Not Your Tasks. There’s a common misconception about being productive — that productivity is about completing a lot of tasks each day and to become more productive all you have to do is complete more tasks. Of course, this is not true. Becoming more productive is about doing work that matters so your measurable output increases. Completing two tasks that move a project or goal further forward is going to produce far better long-term results than completing a hundred tasks that have no impact on any of your important projects or goals. Stop picking the low hanging fruit. We have a natural tendency to go after the low hanging fruit. To check off the easy tasks because doing so makes us feel good. We get that dopamine hit and that puts a smile on our face and has us wanting more. So we populate our to-do lists with even more easy, non-important tasks just so we can check them off and get that dopamine hit. It becomes a vicious circle we put more and more unimportant tasks on our to-do lists hoping for more dopamine hits. Of course, we tell ourselves we are completing important tasks. After all, we must have a clean desk so we can focus better on our work and we need to make sure we have enough staples in our top draw just in case we run out while stapling important documents. Oh, and we should check our email just one more time in case something important has come in. Begin the day with a simple plan. We all have a good mix of easy routine and hard project work to complete each day. Difficulties start when you are not clear about what work is important. Prioritising your work is a big part of becoming more productive. This is why beginning the day with a plan based on what current projects are important is vital. However, the routine work can very easily take over the day if you are not careful. Assign time each day/week for your routine admin work. There are a couple of ways you can make sure the less important routine work does not take over your day. One way is to assign one day each week for admin work. This could be Friday afternoon for example. Friday’s are famously difficult to focus on important work because we are often thinking about our plans for the weekend. If that is the case, you could assign Friday as your admin and clean up day (you could even make sure you have enough staples in your top drawer). This means you only have easy tasks to do on Friday and you don’t need a lot of focus to get them done. Another way is to allocate a time slot each day to do your admin and routine tasks. Giving yourself one hour a day to just get the routine, easy tasks complete will help you to stay focused on the important, project work for the other seven or eight hours each day. I assign one hour a day for all my routine admin work. I usually assign the end of the day to do this because I don’t need a lot of concentration to do it. But you can choose any time of the day or week to do it. Focus on your desired outcome. 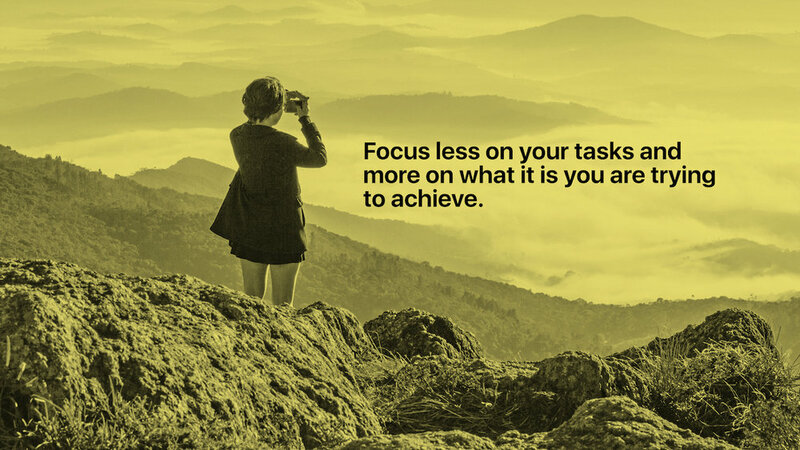 The key to better productivity is to focus on the outcome you want, not the tasks that will get you there. We often add unnecessary tasks when we are planning out a project. For example, “send email to get 2019 planning template”. Nine times out of ten, a phone call would get the desired result faster. You might also find you have tasks such as “talk to John about the presentation order” and lower down your list have a task saying “ask John for the 2019 sales forecast”. These two tasks could be completed either by one phone call or walking down the hall to talk to John, but because the tasks are not grouped together you miss the second one. That means now you have to communicate with John twice instead of once. When you set up a project, you need to be very clear on what it is you are trying to achieve. What’s the desired outcome for the project? David Allen, in Getting Things Done, writes about this and Tony Robbins in his Time Of Your Life course puts a lot of stress on outcome thinking. The tasks help, they are signposts along the way, but more often than not the shortest distance between where you are now and successfully completing the project is not through completing all your tasks in the right order, more often than not the fastest way to completing the project is a simple phone call or going out to see the client or customer. I use Evernote to plan out my projects and not Todoist. I can add tasks and steps I think will be needed to complete the project in a list at the bottom of my project note and once I am satisfied I have everything needed to get the project completed, I go through the list removing tasks I feel are not necessary. What I end up with is a list of absolutely essential tasks. This often reduces the number of tasks required to complete the project down by half. Thank you for reading my stories! 😊 If you enjoyed this article, please hit the life button below. It would mean a lot to me and it helps other people see the story.